The intuitive and powerful quizzing features in Storyline provide you with all sorts of options for creating assessments, surveys, and interactions—as well as displaying feedback and results to let learners know how they performed. Freeform questions: These allow you to build your own questions or interactions out of just about any object you've added to your quiz slides—the ultimate in flexible authoring! 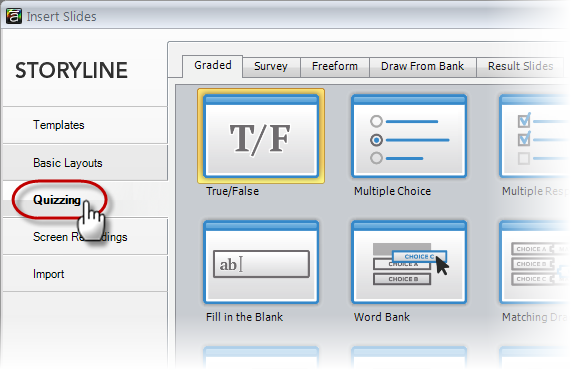 Choose from five different question types, including drag and drop, hotspot, and more. Questions from a question bank: Question banks provide a simple way to create sets of questions and randomize the order in which they display. You can even choose to display just a subset of the questions if you like. Result slides: Storyline's result slide options allow you to compile results from any quiz questions you choose, and then display performance data to your learners. You can even opt to show an aggregate score from multiple quizzes if you like.